The Altair Hypercam 183C PRO TEC Cooled colour camera is the next step when it comes to astro-imaging, with the 20mp Sony IMX183 sensor, amp glow reduction and high sensitivity, for extremely smooth, rich detailed images. The IMX183 is one of the most sensitive Back Side Illuminated (BSI) sensors available, with very low read noise, suitable for both deepsky and solar system advanced yet simple imaging with ROI (region of interest allowing a portion of the sensor to be used when required). Separate 12v power supply included to power TEC with choice of USA, EU or UK Plug socket. Hypercam is much easier to use and focus than a DSLR, thanks to the live preview mode which shows uncompressed video at full resolution. You can see a tiny star-point clearly in real-time, because there is no video compression like with a DSLR video stream. Unlike a DSLR, there's no need to modify your camera to capture detail in red hydrogen wavelengths, because it has no red blocking filter in the way. There are no clumsy power connectors which drop out easily, no firmware to fight with your software, no mirror to lock up, and a "true" uncompressed RAW mode output. You get exactly what this Sony sensor "sees" from without alterations. TEC cooling: Cooling reduces random thermal noise during long exposure imaging. The internal Thermoelectric cooling system (TEC) unit is controlled with your imaging apps, allowing you to set the temperature (which is recorded in the .FITs file header). The Hypercam is designed for consistent, reliable deepsky imaging at up to -45 below ambient temperature. For the IMX183 Sensor, the most appropriate cooling temperature at gain 400 is approx.  10/15°C Absolute, beyond which, no real gains are made. Low read noise BSI sensor. The Sony IMX183 CMOS sensor is ExmorR rated, and Back Illuminated (BSI). BSI technology moves the sensor circuitry behind the pixel, so unlike conventional sensors the light path is not blocked, resulting in higher quantum efficiency than a traditional CCD sensor. Read noise is low, and there is no smear or blooming on bright stars. Try deep-sky "lucky" imaging. The low read noise lets you stack shorter exposures to take advantage of the low read noise, reducing atmospheric aberrations and tracking errors or wind vibration. The more frames you stack, the smoother the image becomes, and the higher the cumulative dynamic range. In this way, long cumulative exposure times of many hours can be achieved with modest equipment. The result is a smoother, sharper image with more detail. Video Astronomy / EAA Friendly. The Hypercam IMX183 sensor is not only desirable for Deepsky Imaging - it's also great for Video Astronomy or "EAA" Electronically Assisted Astronomy. All thanks to the 20mp resolution, high sensitivity, and amp glow reduction technology. What's more you can use the Live Stacking features in the AltairCapture software or SharpCap PRO. All-sky time-lapse imaging or video is easy with a DSLR lens and optional Hypercam Lens Adapters (product code: CLA-EOS or CLA-NIKON). 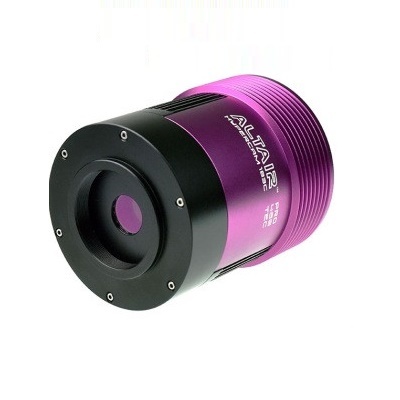 The camera has an ST4 auto-guiding port, and can be used to auto-guide with mounts from all the major manufacturers supporting ST4 format, including iOptron, Celestron and Skywatcher. The IMX183 is more than sensitive enough for autoguiding. Altair delivers proper English-speaking support with a 2 year manufacturer warranty against defects in materials and workmanship. New users should visit Altair Camera Google User Group where you can get answers to technical questions. The group is also a great area to share tips and techniques, to get the best out of your camera. The AltairCapture software interface supports most European languages including English, German, French, Indonesian, Japanese, Korean, Polish, Russian, Chinese, Spanish, Thai, and Turkish. The camera can be fully controlled in AltairCapture and SharpCap to output uncompressed .AVI and .SER video files for solar system imaging, as well as all common still image formats such as .JPEG .PNG .TIFF .BMP, and .FITS (for deepsky imaging) to mention just a few. The Hypercam supports 8bit or 12bit output. The 12 bit output mode can be used for deep sky imaging with less frames needing to be stacked and a wider pixel intensity range. The sensor is extremely sensitive and a good candidate for video astronomy, especially with small refractors. Find out more about bit depth here. Find out more about video & file formats here. The Hypercam platform with Trigger Mode: The Hypercam platform supports Trigger Mode to make long exposures of over 5 seconds easier to control. With most cameras, in normal video mode, you have to wait for an exposure to complete before the camera will accept, say a command to abort the frame, for clouds, aircraft, or an alignment issue, like kicking the tripod and so-on, changes in gain, exposure time, or re-aligning or refocusing. For long exposures, normal video mode is inconvenient, especially for video astronomy and deep-sky imaging, however in Trigger Mode, you can stop the camera instantly (even if you are half way through a long exposure) change the settings, and re-start the capture. USB Port & Cable: 3.0 USB Cable, 1.8m cable (USB2.0 also supported at low frame rates. Downloaded online at cameras.altairastro.com and saved to hard drive. Quick Start & Altair Capture instructions: Downloaded online at cameras.altairastro.com and saved to hard drive. Separate 12v power supply included to power TEC with UK Plug socket.